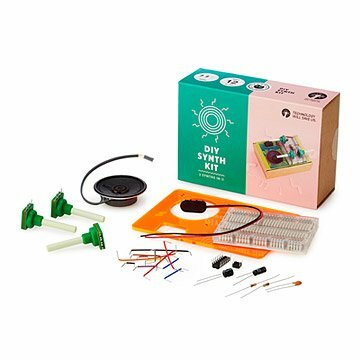 This kit lets you construct three different mini-synths, adding a DIY dimension to electronic music. From a classic 80's Atari Punk Console to Stutter and Dub Sirens, build some radical hardware and then experiment with pitch, frequency, and volume to Kraft(werk) your own unique sounds. This kit lets you construct three different mini-synthesizers, adding a DIY dimension to electronic music. Hack and experiment with the circuits to customize your synth even more. Requires one 9V battery and internet access for easy-to-follow instructions. Made in the United Kingdom. Requires 9 V battery and a computer or tablet with internet access. Fun and interesting. Wish there was a paper manual instead of having to make an account online to view it. Update: New one is working!! Couldn't figure out how to update my older post, so here is a new one. We originally purchased this gift as a birthday gift from my 6 year old daughter for her daddy. They got the first one up and running, but for some reason the chip stopped working the same day. I noted in a previous review that we were disappointed that it stopped working, but found that you could buy new chips for it. However, UncommonGoods saved the day and offered to send a brand new synth kit!!! The new synth kit just arrived and it up and running. :) Thank you!! We love it! This was a gift from my 6 yo daughter to her daddy for his birthday. They worked together to put it together in about an hour. The digital instructions were great! Once they got it working, it was really fun to play with and had great sound. The only con was that the chip stopped working the same day it was made. :( Husband thinks the 9V battery may have been flipped around and fried the chip?? We will be ordering a new chip to see if we can't get it working again. This was a fantastic gift to all music lovers. Have them spend hours tinkering away playing with sound. Compact and lightweight. My husband is planning on building the synths with our six-year-old son. I don't know if he'll be able to use them in his recordings, but they'll have fun with it! This was an awesome, unique gift that's perfect for music lovers. Packaging was beautiful and elevated the entire gift.